BIAFRANS HAVE SUFFERED ALOT OF INJUSTICE IN NIGERIA: BIAFREXIT IS THE ONLY SOLUTION: ENOUGH IS ENOUGH!!! On 20th February, 2016, the British Prime Minister; David Cameron scheduled June 23, 2016 as the date for a referendum of Britain’s membership of the European Union. He allowed calls for Brexit vote even when he is of the opinion that Britain should still remain part of the European Union, and campaigned with everything within his power to ensure that Britain never leave the EU, but unfortunately the result of the vote turned out against his opinion. Nevertheless, David Cameron respected the decision and wishes of the British people even when it was against his personal beliefs. This happened because he understands and believes in democracy, and has taken cognizance of the fact that self-determination is the sacred right of the people. Britain is the colonial master of Nigeria and still largely influences Nigerian government in some of their decisions and policies till date. President Muhammadu Buhari on the other hand, should borrow a leaf from David Cameron and announce the date of Biafra referendum, so that Biafrans can exercise their sacred right of self-determination, as enshrined in the United Nation’s Charter of the rights of the indigenous peoples if he should be counted among the democrats. Biafrans, just like the Britons also has the free liberty and right to vote in a referendum to decide whether to exit or remain in Nigeria. The exit of Biafra from Nigeria has been long overdue. From the days of the unaccented amalgamation in 1914, the forceful and illegal union between Nigeria and Biafra, has never worked out and will never work. Moreover the agitation for the restoration of Biafra have taken many Biafran lives of over 6.5 million, counting from 1946 to 2016, including over 3 million children that were starved to death during the Biafran genocide of 1967-1970 by the Nigerian Government under Yakubu Gowon. Biafrans has suffered all manners of human degradation; from economic starvation of the zone, oil spillage in the Riverine communities which coincidentally lays the golden eggs that sustains Nigeria, wanton killing of Biafrans by the security operatives, mass deportation of Biafrans in the supposed united country, destruction of businesses belonging to Biafrans in various parts of the country, denial of strategic political positions, massacring, razing down their residential homes and destruction of farmlands by Muhammadu Buhari’s janjaweed militia popularly known as Fulani herdsmen and so many other subjugations so numerable to mention being meted out on the people of Biafra. Now that the younger generation of the remnants of the genocide has chosen the path of self-determination as the only way to emancipation themselves from the continued suffering they experience in the British Islamic created Nigeria, it is pertinent the world and the supporters of one Nigeria to understand the determination of Biafrans under IPOB to restore the sovereignty of the nation of Biafra which was forcefully taken away from them. 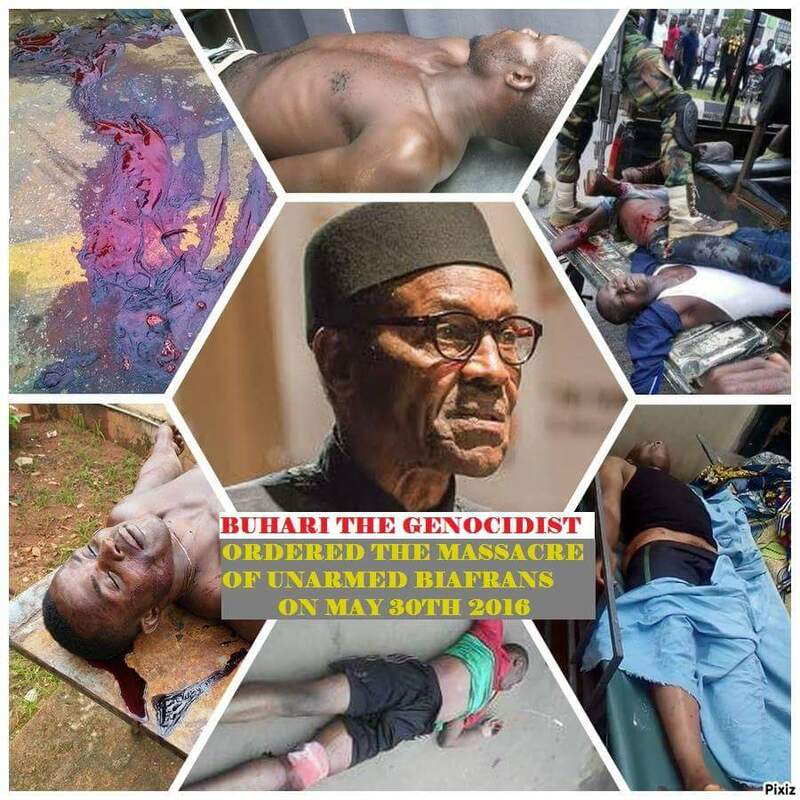 Despite numerous arrests, killings, and incarceration of Biafrans by the murderous security agents of the Nigerian government on the orders of President Buhari who has vowed not to allow Biafra to rise, the Nigeria government and the world should understand that the call for Biafra restoration is not a call for war but a natural law which is enshrined in the UN charter of indigenous peoples. We are urging the EU, UN, US, PMs, presidents of countries that value human rights to support the call for the restoration of Biafra and order Muhammadu Buhari to announce the date for Biafra referendum. If #Brexit is good for Britain, #Biafrexit is also good for Biafra.